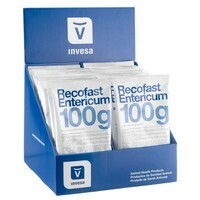 Recofast Entericum is a unique oral powder designed to alleviate the symptoms of scour in calves and foals, while still providing them with the nourishment they need to stay strong. Using natural astringents found in some plants to bind and dry up the diarrhoea, Recofast stops the symptoms, and reduces fluid and electrolyte loss. It contains Carob, Rice and Carrot flours which have a high pectin content which is responsible for the drying up effect. Recofast is also the ideal ‘one sachet’ supplement as it also contains slow energy release nutrition, rehydrates and restores a normal pH electrolyte balance. It can be mixed with water or milk, and should be given at the first signs of scour.